The Asperger’s Difference focuses on 13-year-old Annie, 16-year-old Noah, and 19-year-old Jeffrey-all bright and articulate teens who introduce themselves, discuss their interests, and recall how they found out they had Asperger’s syndrome. Through their stories, this educational documentary attempts to define Asperger’s (symptoms of which vary from one person to another), while also exploring some of the condition’s characteristic strengths and challenges. As the narrator notes, the program might even help those who don’t quite fit the diagnosis but share some of the traits, such as fidgeting, problems with communicating, and trouble with eye contact. According to Annie, who prefers to socialize with adults, “I’m not the life of the party; I’m the death of it.” Jeffrey isn’t so hard on himself, although he does find slang and metaphors confusing (like many with Asperger’s, Jeffrey does best with unambiguous language). Both Jeffrey and Noah find it easier to chat with friends over the Internet, where they aren’t distracted by facial cues and verbal inflections. All three have struggled with symptoms that mimic obsessive-compulsive disorder, such as Annie’s need to repeatedly watch The Phantom of the Opera and Jeffrey’s inability to stop playing video games. The film points out that despite the deficits, people with Asperger’s tend to compensate with superior memorization and reading comprehension skills, among other beneficial abilities. Offering an informative and personal overview of the topic, this is recommended. The Asperger’s Difference: A Film for and about Young People with Asperger Syndrome. Mar 2010. Center for Spectrum Services, DVD, $49.95. (9780615335162). In this program to help viewers better understand Asperger’s syndrome, three teens share personal feelings about their condition and the special challenges they face, focusing on how they overcame feelings of social isolation to achieve success in spite of their personal difficulties. Annie, a precocious 13-year-old, explains how her perfect vocal pitch and loquaciousness helped her excel in school and onstage. High school student Noah talks about his creativeness, musical talent, and high grades, while college freshman Jeff recalls his strengths as a writer, stage performer, and video gamer who must focus intently to complete a task. By exploring what makes these students special and having them personally explain their day-today difficulties (making eye contact, handling social situations, controlling emotions, managing heightened sensory sensitivities, and staying organized), this inspiring film shows that people with Asperger’s are normal, just different. Reviewed by: Nicole Elliott, M.A., Shana Nichols, Ph.D., Laurie Perlis, PsyD, Samara Pulver Tetenbaum, M.A. and Adriane Kruer-Zerhusen, members of the Fay J. Linder Center psychology graduate training program. The Asperger’s Difference is an engaging and educational DVD that is designed to help teens and young adults with Asperger’s better understand their diagnosis. This 30-minute DVD presents information from the point of view of three young people with Asperger’s who are articulate, down-to-earth, at times funny, and easy to relate to. Through their personal experiences, the three young “stars” of the DVD discuss the challenges and positive aspects of having Asperger’s, as well as issues related to receiving a diagnosis, disclosure, and self-advocacy. The DVD includes a companion guide that provides thoughtful discussion questions which encourage viewers with Asperger’s to go beyond the content of the video and explore their own experiences, feelings, challenges, and strengths related to their diagnosis. Also included in the companion guide is a streamlined list of resources, including books and websites, which may be helpful to viewers seeking further information. Divided into a series of chapters, The Asperger’s Difference presents topics in an organized and concise way. A narrator introduces each chapter by giving a general, objective overview of the topic, followed by the three “stars” sharing their own personal anecdotes, feelings, and thoughts. The unique combination of strengths, difficulties, perspectives, and experiences of each of the three individuals are highlighted through the course of the video. The Asperger’s Difference may be best suited for diagnosed teens and young adults who already have some basic knowledge about Asperger’s Syndrome. It is also an excellent resource for families, peers, professionals, and teachers who want to learn more about the disorder from the perspective of diagnosed teens/young adults. While the video realistically presents serious challenges young people with Asperger’s face, there is a clear emphasis on strengths and the potential for growth and improvement over time. Effective services, including counseling, and successful strategies for overcoming some common difficulties associated with Asperger’s are also included briefly in the video. From the candid point of view of three young people with Asperger’s, the video mixes more lighthearted observations with a realistic, yet hopeful portrayal of the difficulties associated with Asperger’s Syndrome. Of the many videos we have reviewed during the last few years with popcorn in hand, The Aspergers Difference ranks among the small number of “must sees”. Noah, one of the stars of “The Asperger’s Difference,” which will be screened at Upstate Films in Rhinebeck on February 6. In the lobby of the Center for Spectrum Services in Kingston hangs a painting. Thin, fine lines detail the Center, illuminated under a darkened sky. Precisely speckling the blanket of night are the constellations that appeared when it was painted—mapped to perfection. It sprang from the mathematical mind of Jesse Park. She has a disorder known as autism. Inspired by people like Jesse, Jamey Wolff, cofounder and director of the Center, created the documentary The Asperger’s Difference, screening at Upstate Films on February 6, about this less commonly known disorder on the high end of the autism spectrum. Not part of American lexicon until the mid-1990s, Asperger’s was mainly overlooked (or misdiagnosed for ADD, depression, or anxiety) leaving kids in a futile struggle to fit into a regimented academic and social world alone. With little details known as to where it stems from and why, and even less understood about how best to teach students with Asperger’s—high schools and colleges contacted Wolff for support. It became clear that these kids were “starting to hit a new set of circumstances—a new set of challenges and people not trained or prepared to deal with it,” says Wolff. Wolff decided on a hands-on approach. She wanted to create a teaching tool sympathetic to the learning style of kids with Asperger’s by relying heavily on repetition and visuals. Broken into chapters, the film helps Asperger kids build their own self-advocacy while enlightening others on how to connect with them. Wolff follows three young adults with the disorder; Annie (age 13), Noah (age 16), and Jeffery (age 18). According to Wolff, the hardest thing to understand is that despite the aloof behaviors of kids with Asperger’s, “they care about social interactions—they just don’t have the skills to be successful socially.” Annie explains feeling like the “odd one out,” the isolation that can result manifesting through her tears. Yet, compellingly, talents come with such ease some are deemed “savants”; commonly possessing heightened mathematical or musical ability. Noah is a fluent singer with a nearly perfect memory. Often finding himself compulsively obsessed with perfection he hangs a plaque on his wall: “Perfection and procrastination are the enemy,”—he jokingly points out its imperfection—words scratched out, “procrastination” awkwardly jammed in, a seeming afterthought. And since face-to-face conversation is difficult, Jeffery turned to the computer. Majoring in computer game design at Marist, he created an online graphic novel, amassing thousands of followers, yet absorbing him so fully that he needs to limit himself with an egg timer. “Their skill set can be a remarkable complement to the diversity of the population…with proper support, understanding, and the right education,” explains Wolff. The Center for Spectrum Services, started with two kids; it now serves 250 kids and has community-based programs spanning a 75-mile radius. With one in every 100 kids now impacted with an autistic spectrum disorder, the documentary breaks open a small hole in the wall of our knowledge. By letting the kids speak for themselves, we’re forced to acknowledge our lack of understanding of them, of the disorder, awakening us to the small breadth of genius that lays in their wake. anuary 8, 2010 – The producer and director of a film that addresses the challenges and gifts of teens with a high-functioning form of autism sat in her seat at Upstate Films in Rhinebeck last November wondering if anyone would show up. In fact, the 160-seat theater was packed. More than 100 people were turned away, according to Jamey Wolff, who also is program director at The Center for Spectrum Services, 70 Kukuk Lane in Kingston, formerly The Children’s Annex. Most purchased the DVD they were unable to see, depleting the first run of 75. To that end, Upstate Films will provide another free showing at 11 a.m. Feb. 6. Also on hand will be a panel that includes Wolff, writer Jane Nofer, clinical director at the center, and two of the three youths interviewed — Jeff, a senior at Marist College in Poughkeepsie, and Annie, a high school student in the Albany area. More DVDs will be forthcoming as well, and these will include the endorsement of two of the most highly respected people in the field of autism, Tony Attwood and Temple Grandin. Through growing media attention spurred by a growth in numbers of individuals on the spectrum, increased reportage or a combination of the two, the public in general is becoming more aware of autism, a disorder of brain function largely marked by challenges with social interaction and communication skills. When the program of the former Children’s Annex started more than 30 years ago, the statistics were 3 in 5,000, Wolff said, although that was before the improvement of diagnoses and the inclusion in the count of high-functioning disorders like Asperger’s. Despite the emergence of autism as a hot media topic, support material for teenagers with Asperger’s was lacking, Wolff said. She said the center’s 30-minute DVD, “The Asperger’s Difference,” helps fill that void. The idea for the film was born five years ago when more and more school districts and even colleges began requesting technical assistance from The Children’s Annex to better assist students with Asperger’s. Wolff said people often notice the “quirky” aspects of individuals with Asperger’s, while missing their positive traits, which often include original thinking, average or above-average intelligence and passionate interests, frequently in the arts and sciences. Other typical traits are honesty and sincerity. “The Asperger’s Difference” is intended, in part, to ameliorate that isolation. Interviewee Noah Tenney, of California, a college freshman with ties to Woodstock, has been raising awareness about Asperger’s for some time. His part in the DVD is a continuation of that effort. On the other hand, Jeff said he has found — especially on the Internet — that some individuals with Asperger’s think the condition gives them the right to indulge in anti-social behavior. “You shouldn’t use Asperger’s syndrome as an excuse to be lazy,” said the communication’s major with a concentration in gaming. In fact, Wolff said the “stars” of the film challenged themselves simply by participating in the project. It is not easy to concentrate and articulate answers, she said, for individuals who have trouble with eye-contact, when a camera is pointing in their faces. But Jeff, who said he is a “naturally fairly fidgety person,” said keeping still was the hardest part. That discomfort, however, was secondary. Others who took part are Tobe Carey, editor, of Willow Mixed Media in Glenford, and Robb Webb, of Olivebridge and New York City. Wolff said Webb narrates the CBS television program “60 Minutes,” announces on the network’s “David Letterman Show” and has appeared in a commercial for Microsoft. Major funding for “The Asperger’s Difference” came from the Daniel Jordan Fiddle Foundation and the Hudson Valley Foundation for Youth Health Inc.
Money earned from the sale of the DVD will go toward services of the Center for Spectrum Services, which supports two schools — one in Kingston and one in Ellenville as well as a clinic in Kingston. The program also offers community-based services and consults with agencies and public schools. A trailer for the DVD can be seen on the Web site www.centerforspectrumservices.com, where it may be purchased. Or call the school at (845) 336-2676, ext. 143. Cost is $49.85. Wolff said the response to “The Asperger’s Difference” has been heartwarming. One woman wept as she told Wolff the effect on her family when they watched the DVD she purchased after being turned away at Upstate Films. For the first time, members understood what her teenage son was going through, she said. The same parent has arranged for a screening in April at the Emergency Services Center auditorium in the Orange County community of Goshen. Wolff said The Mid-Hudson Library System has purchased several copies of the DVD, and she hopes other libraries will follow suit. Although many people with Asperger’s Syndrome display average or above average intelligence, they face problems communicating and are often isolated socially. At no time are these challenges more pronounced than during the teenage years, a complicated emotional time for any young person, but one with additional burdens for those living with this autism spectrum disorder. Now, a new half-hour documentary titled The Asperger’s Difference: A Film For and About Young People with Asperger’s Syndrome, is intended to help these teenagers build self-esteem and develop self-advocacy skills. And who better to reach this special group than three teenagers with Asperger’s, the film’s stars, who tell viewers from first-hand experience what it is like to live with this condition during the middle, high school and college years. The Asperger’s Difference will premiere on Saturday, November 21 at 11 a.m. at Upstate Films, in Rhinebeck. The special free showing will be followed by a panel discussion with two of the film’s stars; the film’s producer, Jamey Wolff, program director at the Center For Spectrum Services (CSS) in Kingston, formerly The Children’s Annex; and Dr. Jane Nofer, director of the Spectrum Services Clinic at the facility, and a nationally known expert on Asperger’s Syndrome. CSS, a school and related diagnostic and consulting clinic, has been providing services for children and adults with autism spectrum disorders for over 30 years. It changed its name from The Children’s Annex several weeks ago to better reflect the range of services it provides. Even before the CSS started its clinic five years ago, it had been consulting with schools and agencies about autism. Over these two decades, Wolff was struck by the special needs of teenagers with Asperger’s who were able to be mainstreamed when they reached middle school, high school or college but who were not having many of their needs met. “There was a lack of resources to help these young people build self-esteem and understand themselves,” said Wolff. “I haven’t seen anything that is visually oriented.” This is particularly striking in view of the fact that people with Asperger’s are visual learners. This is the reason the film plays to this learning style with its use of graphic content to emphasize and explain the material. The content of the film presents both the strengths and challenges that accompany Asperger’s, told by each of the three young people – Annie, a middle school student; Noah, a high school student; and Jeff, a college student – in their own words in response to specific questions designed by Nofer and posed off-camera by Wolff. Wolff served as the producer and director. The film is presented as a series of visual chapters in which Annie, Noah and Jeff discuss the common challenges and strengths shared by people with Asperger’s: difficulty with social interaction, controlling thoughts and behaviors, and heightened sensory experience, but also talents that can, at times, verge on genius. The film opens with 13-year-old Annie sitting on her bed surrounded by her stuffed animals and her boombox. Her experience being teased and bullied by her peers was actually one of the factors that motivated Wolff to move ahead with a film she knew was sorely needed. At school, Annie excels academically by she is challenged socially. “Believe me, I am not the life of the party; I am the death of it,” she says matter-of-factly. Noah, 16, is plagued by perfection. Reminding us that “everyone’s brain is wired differently,” he communicates with friendly mostly from his room and by computer. And, from his dorm room, Jeff, an 18-year-old college freshman, discusses his problems interacting with others and what he has come to label “foot in mouth syndrome.” He has also created his own term, “the laser eye effect,” to describe the discomfort he experiences when someone looks him in the eye for any period of time, a problem for many people with Asperger’s. The three young people, typical of their peers elsewhere in so many ways, may have difficulty processing what people say to them, knowing how much to tell others and when to say it, and controlling thoughts that can overwhelm them. They may hear, see, feel or taste things more sensitively than others, leading to sensory overload. Their different behaviors can easily make them targets for bullying, leading to feelings of isolation and worthlessness. But we also learn that Noah has a remarkable ear and is able to sing in a way his halting speech does not allow him to express himself – and with a talent few of us could match. He usually gets A’s in school without studying because of his perfect memory. Annie can recall the lines and songs from movies perfectly and Jeff loves to perform Shakespeare. Sensory sensitivities have their flip side: Annie has nearly perfect pitch as well and sees many things quickly. People with Asperger’s Syndrome have the ability to focus on things they are passionate about, we learn, and this has allowed Annie to be highly creative. The same challenge that has led Jeff to set an egg timer so he can self-limit his computer time allows him the focus to compose poetry. With their vignettes interspersed, and in often poignant and non-clinical terms, each of these young people offers a deeper understanding of what living with Asperger’s really means. The film was created to address the needs of individuals who are newly diagnosed; those with a diagnosis who could be helped by having the challenges and strengths reiterated; and family, peers, teachers and employers of those with Asperger’s, according to Wolff. In fact, it would be a perfect addition to the diversity shelf at any school or library, offering insight into differently-abled people. It can be viewed on an individual basis, in a classroom or other setting with a facilitator using the accompanying discussion guide, or in a group setting without a facilitator, said Wolff. The film broaches a highly sensitive subject at the end: when people with Asperger’s should tell others about their disorder. The nature of the relationship and consideration of the possible outcomes are discussed. Wolff had wanted to use three former students from the school, which serves young people up to the age of 12. Annie had been at the school and Wolff had stayed in touch with her parents. When Wolff learned about the extent to which Annie was being bullied, she said “it was the final piece that motivated me.” Noah is a family friend who Wolff has known socially for much of his life. Three years ago, after Wolff was interviewed by the Poughkeepsie Journal as she was starting the film, Jeff’s mother read the article and called to urge her to include a college-level student. “We interviewed each other and both passed the interview,” she said. “From my experience and the experiences of other people who have seen it, the film is unique,” said Kelly McMullen, head of the Local Government Unit Program Support for Adult Services at Ulster County Mental Health. McMullen was the local government staff representative at a committee meeting of the County Legislature on October 14 when the film was screened before 16 representatives from ten different agencies. The response was “completely positive,” she said. The film is a local effort. Filmed by Tobe Carey of Willow Mixed Media, its funders included The Daniel Jordan Fiddle Foundation, The Hudson Foundation for Youth Health, Inc., and the Michael & Gertrude Hancouski Foundation as well as Wolff’s mother, Ruth Wolff. Wolff and Nofer donated their time. Difficulty communicating and social isolation have come to be seen as hallmarks of Asperger Syndrome (AS), and while many with AS display average or above average intelligence, they face obstacles in their daily life with peers. At no time is this loneliness and isolation more heightened than when beginning the already complicated emotional and physical transition into adolescence and adulthood. While Asperger Syndrome has become a more commonly known and understood condition, many teens embarking on their middle, high school, and college years require help in understanding their disability and need support to build self-esteem and develop self-advocacy skills. It was with this group of adolescents and young adults in mind that The Asperger’s Difference: A film for and about young people with AS was conceived and executed. “The idea for the film came to me 5 years ago when I was starting to see increased numbers of children with Asperger Syndrome reach their young adult years,” says Center for Spectrum Services Program Director and co-founder, Jamey Wolff. “This is a time when they have the growing ability to understand what AS is and began to learn to advocate for themselves.” Since individuals with AS are generally visual learners and respond well to visual content in videos and films, it was surprising that there have been few films about AS expressly created for this population. For more than 30 years, The Children’s Annex which has recently changed it’s name to the Center for Spectrum Services, a not-for-profit center, has specialized in education, evaluation and treatment of Autism Spectrum Disorders. Two New York State approved day school programs serve students throughout the Hudson Valley at campuses in Kingston and Ellenville, New York. The Center for Spectrum Services also provides diagnostic evaluations for Autism Spectrum Disorders for people of all ages, consultations and trainings to schools and agencies on best practices, and groups for children and teens focusing on social skills and self-advocacy. Jamey Wolff worked in collaboration with Dr. Jane Nofer, Clinical Director for The Center for Spectrum Services and a nationally known expert on Asperger Syndrome to establish the film’s guiding principles and write the script. The film, presented in documentary style, spotlights young people with AS as they talk about their experiences, challenges, and hopes for the future. The content is designed to help young people with AS understand their diagnosis, the positive aspects that accompany it, as well as think about when to disclose their diagnosis to others. Finally, the film seeks to build self-esteem and help viewers to understand they are not alone. The resulting 30 minute film, The Asperger’s Difference, stars three young people with Asperger’s as they navigate the waters of their daily life and articulate their experiences to the target audience. Annie, a middle school student, Noah, a high school student, and Jeffrey, a college student, represent a range of ages and circumstances but share many of the common challenges and strengths of individuals living with AS. And yet, these remarkable young people also provide a window into the often overlooked strengths that can accompany Asperger’s Syndrome. Individuals with AS often have heightened language and memory skills which are manifested in Noah’s exemplary academic performance. The sensory sensitivity which can prove so challenging, also lends Annie musical talents and perfect pitch. The intense concentration that requires Jeffrey to employ an egg timer to limit his computer use conversely provides him the focus to compose poetry. Each of these young people bring a poise, self-awareness and sense of humor which help the audience to see the full picture of what it means to live with AS. 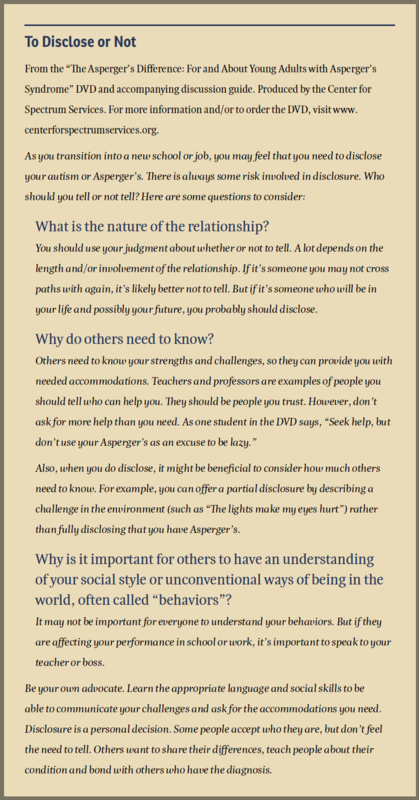 The final chapter of The Asperger’s Difference is designed to help young adults with AS to develop self-advocacy by thinking about when to share their diagnosis with others. Viewers are invited to consider aspects of disclosure, such as the length and nature of a relationship and the outcomes which may occur. The Asperger’s Difference can be watched by individuals with AS alone, in classrooms, with clinicians, or family groups in its entirety, or discretely by stopping and starting chapters with the support of an instructor or therapist. The film, presented in a documentary format, has value for peers, siblings and others who are touched by autism. The accompanying discussion guide is intended to allow the viewer to personalize the information and experiences seen in the film. As many individuals with AS are strong visual learners, the film also plays to this learning style through its graphic design, presented clearly and employing a series of Picture Communication Symbols (PCS) ©1981-2008 Mayer-Johnson, LLC. The film is scheduled to be released this fall. A trailer for the film was recently shown at the New York State Regional Forum on Autism Awareness and generated considerable excitement in New York’s autism community. Jamey Wolff credits the generous support of The Daniel Jordan Fiddle Foundation, The Hudson Foundation for Youth Health, Inc. and The Michael & Murtrude Hancouski Foundation for their support in the production of The Asperger’s Difference.